Back before I started I started my blog in 2010, I noticed there was someone around the internets calling themselves Vegan Lazy Smurf. I thought it was really cute because a.) I like the Smurfs and b.) Vegans aren't exactly known for having a sense of humor (self-deprecating humor anyway). So I feel like Lazy Smurf (and to a degree, Whoa Wren) had a part in making me feel comfortable in my Vegan laziness. What you need to know about VLS is that she blogs about travel, her recipes and the great city of Austin, Texas. I recently visited Austin and used her definitive Austin Vegan Guide to make my way around the city. 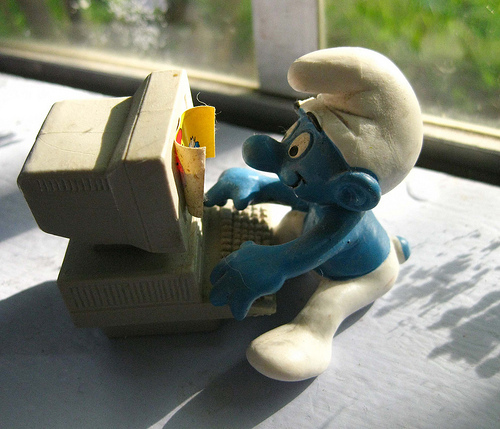 When not blogging, you can find Vegan Lazy Smurf on Twitter, loving Star Trek and dreaming of Hawaii. But I think what you really want to know is what three pre-packaged food items she is going to want when you two are trapped on a desert island, right? My favorite frozen burger is from an Austin company that used to be a food truck but now sells their frozen hemp burgers and sausages. It's called Good Seed Organic and they are passionately against using GMO ingredients and making sure everything is organic. And their burgers are absolutely delicious. Without a doubt my favorite non-prepackaged veggie burger in the world is at Arlo's trailer here in Austin, they have the best bacon cheeseburger I have ever had and my non-vegan friends seem to be just as stoked about them as my vegan friends. Well maybe not just as stoked but they really like them! I totally had to look at your Pinterest because I couldn't think of any but yeah there is a lot! I think I'd have to go with the Rising Moon Stuffed Raviolis. Whichever one is currently in my freezer. Usually the So Delicious with Coconut Chocolate Peanut Butter Swirl. They also win for longest name of an ice cream in the history of our world. I like Nadamoo and Tempt too. My all time love, though, is Sweet Ritual in Austin, they have this Not-Tella milkshake there that'll kill you. Any kind of tortilla chips with Food For Lover's queso. Fake Rice Krispies! I mean Cripsy Brown Rice Cereal. I especially like the Erewhon brand. Anything chocolate. I love the Chocolove Dark Almonds with Sea Salt so much. Big Green Pimento Stuffed Olives, like the kind you put in martini's. It's either olives or a suicide pill for me. After that, I would need some kind of chocolate ice cream and maybe some Grandma's Hummus so I wouldn't starve. I can hardly think of anything that hasn't been veganized, I bought some vegan chicharrones yesterday! I love kit kat bars, I know there are vegan alternatives but it'd be nice to walk into any store in the country and buy one. Rabbit Food Grocery is our fantastic new all vegan grocery in Austin. They keep expending into further realms of awesomeness. I also love Wheatsville co-op here in Austin, their popcorn tofu, frito pie, Red Rabbit Donuts, and greasy mac and cheese make sure I will never waste away. And that concludes The Laziest Vegans Top Ten. Thanks Vegan Lazy Smurf! What a great posts! There are some brands in there I'll definitely have to check out! And I'd love a Kit Kat Vegan stye too--and GF too!! thanks for sharing!